Collards are part of the very nutritious broccoli and cabbage families. It grows edible round, large, dark green leaves from a thick stalk. The leaves are thicker and larger than most cabbages leaves, giving it a heartier presence in a dish. In South America, it is sliced into thin strips and cooked into soups for added texture and nutrition. It is found nearly a part of every meal in Kashmir region, where a much loved soup called haak rus is made from nothing but fresh whole collard leaves, water, salt and oil, and eaten with fragrant rice. Collards are high in vitamins A, K, C, folate, manganese and calcium. – Always wash your collard leaves well before prepping. – Many suggest washing, cutting collard leaves into smaller pieces, then allowing to sit for five minutes to activate enzyme process before cooking. – Many of these cuisines all point to value of retaining all the wonderful nutrition of collards by cooking “low and slow” for half an hour to an hour. Add washed whole or cut leaves to a pot and cover with water, add a sprinkle of salt, and let simmer until leaves are sitting nice and tender in their own nice green broth. Some people add cured or smoked meat, or shiitake mushrooms to this simple way of cooking. Makes a nice nutritious, easy to digest side dish. Select leaves free of yellowing. Sometimes you’ll find collards that are organically grown with holes, most of us do not find the holes to affect the taste of the collards at all. We enjoy the fact the greens are organically grown. 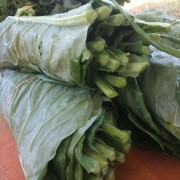 Collards should be stored in the refrigerator wrapped in moist paper towels in a plastic bag to keep it moist. It can be kept like this for up to 5-7 days.